“But we have only five loaves of bread and two fish,” they answered. “Or are you expecting us to go and buy enough food for this whole crowd?” For there were about 5,000 men there. Jesus replied, “Tell them to sit down in groups of about fifty each.” So the people all sat down. Relate: Peter was in prison. Jesus had risen and gone into heaven. Pentecost had come and the number of people joining the church had exploded into the thousands. The religious leaders and then even Herod had taken notice. First, the Jews in Jerusalem stoned Stephen. Then, in an attempt to win over the hearts of his people Herod had James, one of the three leading disciples captured, imprisoned, and killed. After that he caught the big fish. Peter was in jail and tomorrow he was scheduled to die. React: God does what He is going to do only after we have done all that we can. It is not always the case, but it is true enough to make it a rule and then point out the exceptions. The widow’s oil did not start pouring until after all the jars had been collected. Gideon’s fleece didn’t get wet (or stay dry) until after he had already summoned the army. And the five thousand did not get fed until after they had been seated in groups in expectation of a meal. All too often I find myself praying for a miracle I am not prepared to handle. I am saying, “God send revival to my church” while He is saying “You couldn’t handle it.” I want to see big things happen but I am not ready for them. I am not prepared for them. I have not positioned myself to be ready to respond and move forward when the miracle does happen. Why? Because as much as I am asking, I do not really believe, I do not really expect, that the miracle is going to happen. It is time to get up, get dressed, and start walking because God is going to move. Am I ready for it? Are you? I want to be ready for what You want to do. Help me to be about Your work. Help me not just pray, but also to prepare for an amazing move beyond anything I could ever expect or imagine. Let me be about doing all that I can do so that I might see what You are willing to do. I broke my leg yesterday and had an operation to repair the broken femur. 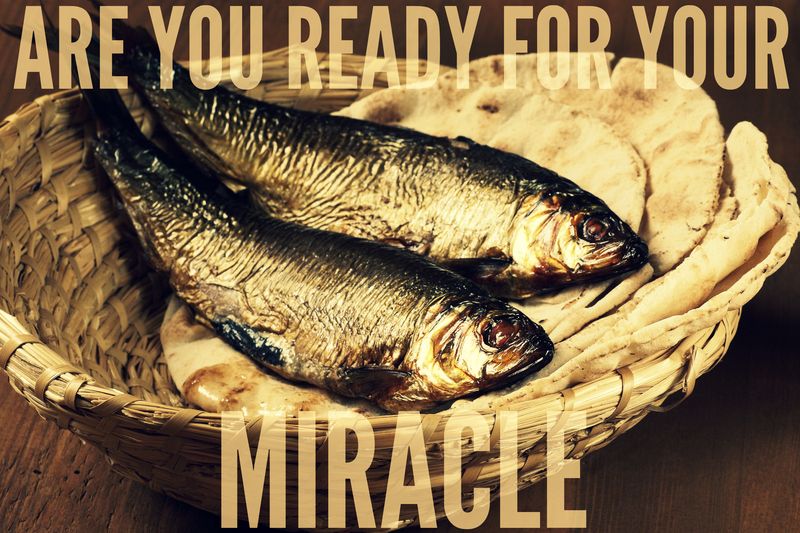 Yes Lord, I am ready for a miracle. Help me to start walking today. Amen. Hi BJ, I hear what you say and I agree but …. there are also times when God just provides it all, including the part He wants us to play. I remember a number of years ago, we had a youth group meeting of about 25 and the leader was giving a bit of a mini sermon. I heard what he was saying but it just didn’t seem to be coming out right. I could literally barely sit still in my seat because I felt I just had to speak. Finally I apologized for interrupting and asked the leader if I could say a few words when he was finished. Our leader said no. He then said that God had told him to sit down and let me speak, so he did and I did. The words just flowed, it was effortless, it was like Jesus was there. And then it was done, it stopped and I sat down. A number of the youth accepted Jesus that night. I’ve seen this happen on other occasions too. Sometimes, like you said, all we need to do is stand up. Blessings! “And” you were ready for the miracle of hearing and acting (I read it in a very kind and connecting way). That the leader was ready to hear and act upon the hearing (by sitting down). And – as always – your comment has more than one participant – probably many (seems to be the way) – including some who were “ready” (ditto). And thank you for allowing me to see BJ’s post here about “miracles (we so often think of as only BIG STUFF!!) and being ready” in a very personal and intimate way. NB: I have seen others write something similar – but who were not ready – who never stood up (and saw another do what they wished they could). I think someone is always “ready” – which is why I have stopped expecting me to be ready to my timescale. I think that God doesn’t “need” me like I so often think He needs me. I think that is just my baggage. Peter had to stand up get dressed and follow. You had to stand up and speak out. The youth leader had to be obedient and step aside. God provides the agenda but we still have to be obedient in following it. Awesome testimony. I can remember coming places as a visitor and being asked to say a word and that ended up leading right to altar call. So much for a day off, but God knows what He is doing. Sure am ready and yes, He is on the move. He is certainly moving in us and we are so blessed to call Him Abba Father. 😉 lol. I just posted a personal story about God doing this kind of thing on my blog. He gave the direction and then it was my job to believe and move towards it.